LeBron James delivered for the Cavaliers, scoring 41 points to force a Game 7 against the Warriors in the NBA Finals. Awe tends to follow LeBron James, but on nights like this it is a deluge. A week ago, a dynasty of inevitability stood between James and the title—not just the most accomplished team in NBA history, but one holding a 3–1 lead proven insurmountable in the championship round. James responded first with a masterful duet that made its own history. Then, in the final home game of Cleveland’s season, he delivered a performance of complete, unmistakable command. Cleveland surged early with James running out for rousing scores. Rallies were quashed throughout with solo LeBron runs. Possessions came in which James was Cleveland’s last line of defense and ended with a signature defensive effort. Threes were taken and made to prove a point, while assists were sought out and conjured to make the most of every advantage. One cannot undersell the importance of the Cavs working and running as a group, but it was through James that every player on the floor became dangerous. One would be hard-pressed to find a performance so brilliant and so meaningful in all of LeBron’s body of work, which considering the scope of his career, makes this an all-time feat. Such is the only way to describe the weight James carried—through 41 points (on 16-of-27 shooting), 11 assists (to one turnover), eight rebounds, four steals, and three blocks—in Cleveland’s 115–101 victory. So propulsive was his play that the Cavs never seemed to be in any serious danger. They dominated the first five minutes outright and controlled the remaining 43, no matter which lineups Golden State tried and which options it moved through. The court has never looked so lonely for the 73-win Warriors. Many of the game’s first 36 minutes were an exercise in desertion. Klay Thompson showcased the worst judgment of his season. Draymond Green’s appearances were oddly intermittent. The back of Andre Iguodala seized up in the first half, sapping him of vital mobility. Harrison Barnes, who has made all of two shots since last Friday, saw his confidence abandon him followed by the Cleveland defense. Andrew Bogut missed the game with a knee injury suffered in Game 5 and no other center on the roster inspired confidence. For the longest time, Golden State’s only flickers of hope came courtesy of Stephen Curry (30 points on 20 shots), who created more off the dribble than the Warriors generally prefer. The situation called for it; Curry’s teammates had left him little choice. A collective Warriors effort allowed for the beginnings of a comeback, but it would never be seen through after Curry picked up his sixth foul with 4:22 seconds remaining in the fourth quarter and the Cavs ahead by 12 points. Curry had been bold with his reaches throughout the night, no matter his foul trouble. It just so happened that his fifth and sixth fouls were fairly innocuous plays—the former a clean poke away from Kyrie Irving (albeit across the body) and the latter a tangle with James without much real contact. Still, his final gamble was foolish. The last play of Curry’s night was one he never should have made, even if the whistle it triggered never should have blown. 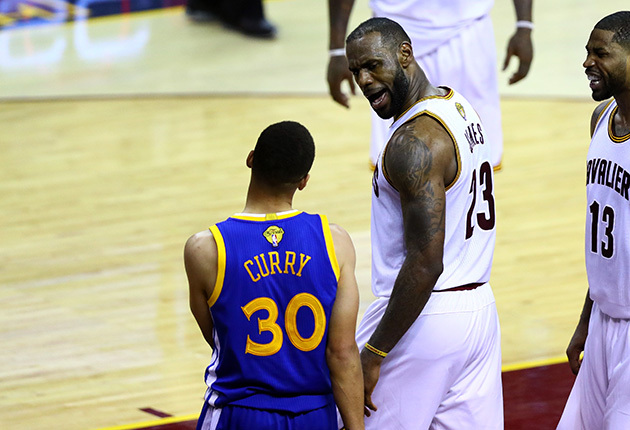 Curry will have his chance to restore order on Sunday, when this Finals series resumes and ends. The stakes are self-evident but the means of getting there cannot be forgotten. This series was over in the closing minutes of Game 4, when Green lost his mind in the moment and earned a one-game suspension. Everything since has been piloted by James, from the way Golden State has frayed to the admirable cohesiveness of Cleveland’s defense. Pressure builds behind legendary performances. Soon, with the season on the line, we’ll see it released.